Description - You Can Learn IET! 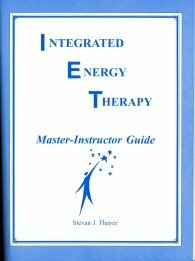 The Name Master-Instructor: “Master” refers to the mastery of the IET energy that you will receive in this class which results in the full expansion of the IET energy ray and brings an even stronger level of IET energy through to the practitioner during self-treatment, absentee, and client sessions. Instructor refers to your ability to teach IET classes (including attuning others to the IET energy rays). Prerequisites: IET Master-Instructor classes are open to any IET student who has completed the IET Basic, Intermediate, and Advanced levels by the time of the class. You don’t have to have been using your previously acquired IET skills in order to take this class. In fact, many students who take this class have little or no practice yet in using their IET skills with others. This IET Master-Instructor class will greatly empower your ability to Envision, Embrace, and Enact the Energetic Potential of your vision and dreams and bring them alive in the world. By focusing on optimizing your 12 Strand DNA, this class will open your energetic pathways to manifestation and support you in living the life that you are destined to live. This class offers you an opportunity to be in vibrational alignment with your dreams and desires. In addition to being a wonderfully supportive weekend focused on helping you live your vision in the world, the techniques you will learn in this class will enable you to help family, friends, and clients live their visions as well. Claiming and Living Your REACH: Beyond your vision for yourself in the world is the angels’ even greater and grander vision for you in the world – something we call your reach. You will begin by identifying and claiming your “reach”. Opening your Channels to Manifestation with IET Sacred Geometry: You will then receive the IET Master-Instructor attunement and learn and use the IET Master-Instructor 12 Strand DNA techniques designed to open your channels of manifestation and clear your resistance to manifesting your reach and bringing your dreams alive in the world. You will learn to use sacred geometry to harness the IET rays for the 12 Strand alignment technique, the IET powerburst technique, the I-Chi technique, the Karma Clearing technique, and more. IET Attunements, and Teaching others how to heal their lives: You will learn how to use sacred geometry to give Basic, Intermediate, and Advanced level IET attunements. Then, in support of your living your reach, you will receive 6 Basic, 6 Intermediate, and 6 Advanced re-attunements designed to open and strengthen your channels of manifestation. We call it our IET Energy Fun Fest! If teaching is your gift, this class provides you with agendas, guidelines, and suggestions for teaching and certifies you to teach the Basic, Intermediate, Advanced, Pets, Kids, Healing Angels IET classes and IET Steps to Transformation classes . Master-Instructor Attunement: You will receive a special Master-Instructor Level “energy attunement” that will further open your energy field to the power of Integrated Energy Therapy® Master-Instructor Level ray. Our Master-Instructor Level attunement expands, realigns, and restructures the 6th pair (alignment with the divine) of your 12 Strand DNA. The activation of the 6th pair turns on your ability to activate the DNA of others and attune them to the Basic, Intermediate, and Advanced Levels. In addition, once your attuned to the Master-Instructor level IET Ray, your energy field will operate in an increased state of spiritual surrender know as “thy will not my will”. Please note that IET Master-Instructors are not empowered to teach the Master-Instructor level training program or attempt to attune students to the Master-Instructor level. Only IET Master-Instructor Trainers can teach the Master-Instructor class. Practical Spirituality: Learn “business basics” of advertising and running your IET sessions/classes. This includes understanding and clearing the primary blockages to your business success. Language Requirement: The IET Master-Instructor class is taught in English and the Master-Instructor training guide is written in English. Students do not have to be fluent in English to attend the IET Master-Instructor class, but rather, they should be able to communicate at a basic level so that they will get the most out of the class. Also, as a graduate of the IET Master-Instructor training class you are not only certified by The Center of Being, Inc. as a Master-Instructor, but you also enter into an ongoing relationship and communication (via. email, phone calls and letters) with the staff at The Center of Being. The requirement for basic English is based on the fact that The Center of Being is located in the United States and our staff only speaks English. Typical communication may include questions that you may ask us about a client or a student, clarification that you request on a particular detail of the IET technique, updates that The Center of Being sends out to you on the IET system and its application, etc. Class Length: Master-Instructor Parts 1 & 2: 2-days (approx. 15.5 hours). This class is designed to be taught in two days, and typically runs from 9:30 AM to 6:00 PM each day. The actual length and times of class vary by individual Integrated Energy Therapy® Master-Instructor Trainer. 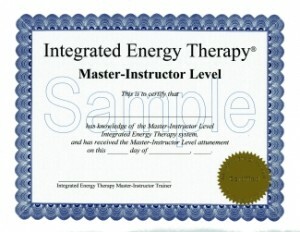 Class Materials: You will receive a fully illustrated 82 page Integrated Energy Therapy® Master-Instructor Level Guide and an official Integrated Energy Therapy® Master-Instructor Level Certificate. In addition, upon graduation you will be listed in the International IET Master-Instructor directory on this website. Note that a few classes may have slightly different prices due to the cost of living in those locations. The early bird fee is given when your registration deposit is received more than 30 days prior to the class date. Some classes have an optional lunch fee. Please see specific classes listings for details. Cancellation Policy: If a student (or reviewer) cancels more than 30 days prior to the first day of the training class, the deposit will be refunded minus a $50/€50 processing fee, or the full deposit will be applied (once) to a future class of your choice (you can pick which one you want), without losing the $50/€50 if you stay with the same Trainer for the future class, and there are still spaces available in that class. If you want to switch to another Trainer’s class, you will have to pay the $50/€50 processing fee due to administrative fees associated with moving the deposit. If a student cancels 30 days or less prior to the first day of the training class, they will forfeit their entire deposit.